The US government says it still expects to have an agreement, but a signing ceremony by the end of the month is going to be more difficult to achieve. There are problems with the new trade agreement with China. Negotiations are continuing, but there have been problems with some of the provisions wanted by the US and resisted by China. Both sides are negotiating the final points, with the US worried about verification of the movers to fulfill commitments and the Chinese worried that they might give up too much to get a deal. It still looks like a deal will be done eventually, but it will take longer than had been indicated to get the last parts completed. Winter wheat markets were sharply lower again last week. Demand worries and ideas of big supplies in the US even with a reduced crop supported the selling. USDA supported those ideas on Friday by showing increased ending stocks estimates on reduced export demand. Export demand for US wheat has improved recently as Russian prices have stayed above those in the US, but the stronger US Dollar Index has helped to keep Wheat prices on the defensive as the stronger dollar promotes higher US prices in local currencies. Word of cheaper offers from Europe and Russia put US wheat values down. The temperatures in the US remain cold, and winter wheat is still dormant. Long range forecasts suggest that the US Great Plains and Canadian Prairies will suffer through below normal temperatures at least through the end of the month. The fall season in both winter wheat regions featured a lot of rain that hurt harvest and planting, and it is likely that not all intended acreage got planted to wheat. Wet weather has continued for much of the winter, and it is likely that the crop will have good soil moisture to work with as it comes out of dormancy in the next month. The state departments of agriculture released their monthly crop condition updates a week ago, and the winter wheat crop condition is not good and significantly worse than previous reports due to the fall planting problems and the extreme weather seen in winter wheat growing areas over the winter. Weekly chart trends are down for SRW with a target near 420. Weekly trends for HRW are down and also target about 420. Minneapolis remains the stronger market and has not completely turned trends down. It could move to about 525 if it does go lower, and possibly 485 over time. Corn closed lower last week on demand concerns. Oats closed slightly higher. USDA confirmed some of those concerns on Friday by dropping food and ethanol demand in its monthly supply and demand updates. It also dropped export demand, and this was a little of a surprise for the market. Traders have been worried about demand even though the weekly export sales reports have been strong. Ethanol demand has been dropping with weaker petroleum prices and demand for animal feed has been weak for a year and remains weak. South American weather is generally good as more showers are reported in central and northern Brazil. The winter corn crop is being planted as soybeans get harvested, so the rains are very beneficial after an extended dry season. US farmers are still trying to decide on their planting mix this year. 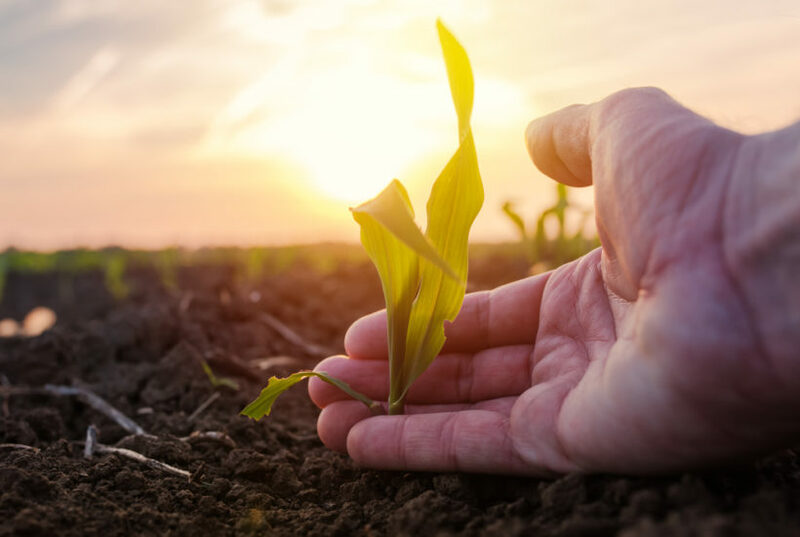 Corn planting should be starting in areas near the Gulf Coast, but fieldwork in many cases has been delayed by excessive rains in the past few weeks. The pattern of big rains every few days does not seem to be changing for this week. Weekly chart trends in corn are down with targets of 353 and 338 on the nearest futures contract. Weekly chart trends in oats are down with objectives of 322 and 282 basis the nearest futures contract. Soybeans and products were lower last week. USDA released its monthly supply and demand estimates on Friday and showed a slight increase in crush demand and unchanged exports. Ending stocks estimates were in line with trade expectations. Production estimated were slightly lower in Brazil due to the earlier extreme weather and unchanged in Argentina. Demand for US soybeans was strong in the world export markets again last week. The US sold more than 1.0 million tons to various buyers including China. China was also reported to have bought a significant quantity, perhaps another 2.0 million tons of US soybeans, again late last week. Brazil is over half-done with its harvest now and should start to show increased offers and very competitive prices soon. Argentina also looks to export this year as crops there are much better. Ideas are that the US export sales pace will fall seasonally in the near term. The weather in the US is very cold in the north and very wet in the south. Very little fieldwork is getting done, and planting delays are possible for corn and rice. This could force more acres to soybeans unless the weather changes in the next month. Weekly chart trends are mostly sideways in soybeans and soybean meal, with soybean meal still holding at important support areas near 300.00 basis the nearest month. Rice was higher for the week and made new highs for the move. Rice is now a weather market as planting conditions remain very difficult in much of Texas and areas near the Gulf coast. It is still raining in most Rice production areas, and initial fieldwork is not really getting done. Planted area estimated by USDA might go lower yet unless the weather gets better or the prices show significant improvement. USDA made no real changes in its monthly supply and demand estimates. Demand is holding strong as seen in the weekly export sales reports. Cash prices paid to farmers have been mostly stable on moderate mill demand. Cash prices for new crop rice are below those for the current crop due to ideas on an unchanged planted area and better yield potential. All that could change if the weather remains as it is for another few weeks. There has been some rice planted near Houston now, but most areas are still quiet and farmers are waiting for drier weather. The planting season is off to a tough start. World vegetable oils prices were mostly lower last week. Only palm oil managed to close with small gains in consolidation trading. Weekly chart trends are down in all three markets. Palm oil held as demand reports from the private surveyors showed that palm oil demand remained weaker. There were some reports that production in Malaysia was holding better than expected. Production usually trends lower at this time of year due to seasonal factors, but reports from the country indicate that production has held closer to unchanged. MPOB will confirm or not this talk in its monthly updates. Meanwhile, futures are now against previous lows and can hold for now. Canola continues to move lower as supplies in the country remain high and demand has softened. Compounding the problem for canola is a court case in which a Chinese national could be deported to the US on industrial espionage charges. The hearings on the case are underway in Canada now and the hearings and entire case have caused friction in the relationship between Canada and China. Soybean oil broke support and turned trends down. It could eventually test support near 2800 basis the nearest trading month. US soybean oil faces increased competition in world markets from Argentina as its Soybeans are harvested and processed. Argentina will look to reclaim its position as the largest exporter of Soybean Oil in the world. Cotton was higher again last week and futures remain mostly in a trading range. The weekly export sales report showed weaker demand for US cotton again, but the market seemed more impressed with what was going on in Washington and in growing areas of the US. Even news on Friday that China had bought a lot of cotton in India and Brazil did not do enough to push prices lower to stay. The USDA reports were considered mostly neutral as USDA made no changes to any of the estimates in the monthly supply and demand tables. The trade had anticipated slightly less production and slightly less export demand. The US weather continues to feature a lot of rain in the south, and fieldwork and initial planting in far southern areas are mostly delayed. Current long-range forecasts suggest that wet conditions will continue in the Southeast and that Texas could see unsettled and colder than normal weather at least through the end of this month. FCOJ was lower and made new lows on the daily and weekly charts. Trends are down on both sets of charts on ideas that production remains strong and demand does not. The market has absorbed speculative long liquidation and producer selling through the winter as no freeze has developed. The oranges harvest remains active in Florida as the weather is mostly dry. The fruit is abundant. Florida producers are seeing small sized to good sized fruit, and work in groves maintenance is active. Irrigation is being used in all areas. Packing houses are open to process fruit for the fresh market, and all processors are open in the state to take packinghouse eliminations and fresh fruit. Mostly good conditions are reported in Brazil, and some beneficial rains should be seen this week. USDA left Florida production estimates unchanged at 77 million boxes last week. Futures were a little lower for the week in New York after testing recent lows for the move and holding. Prices closed unchanged for the week in London. New York trends are down. Weekly chart trends are sideways in London. Speculators are keeping the pressure on the New York market as they fear big supplies of Arabica with not enough demand. A stronger US dollar has also created speculative selling pressure. Brazil export data has shown a strong pace at over 3 million bags for the second month in a row. The strong pace comes at a time when Brazil exports are starting to wane. The ICO has forecast a surplus year again this year, and inventory data from ICO and others shows ample supplies. Prices are moving below profitable levels for Colombia, and have been below profitable levels for producers in Central America. Further weakness will cause farmers in Brazil, Peru, and Vietnam to start losing money as well. Brazil had a big production year for the current crop, but the next crop should be less as it is the off year for production. Both markets were lower for the week as the US dollar trended higher. Chart patterns on the weekly charts are down. The fundamentals still suggest big supplies, and the weather in Brazil has improved to support big production ideas. Reports that Brazilian mills might pause and give Sugarcane production a chance to improve helped support the market. Brazil weather is improving in all areas as there is less rain in southern areas and more to the north. Brazil has been using a larger part of its sugarcane harvest to produce ethanol this year instead of sugar, but Thailand has shown increased production this year. Ideas that production in India and Pakistan is being hurt by news that Indian mills are asking the government not to force them to sell sugar into a depressed world market. They do not want to lose more money as they have already needed government subsidies to keep working. The ISO now estimates the world Sugar surplus at 641,000 tons in 2018-19, from its previous estimate of 2.17 million tons. Very good conditions are reported in Thailand. Futures closed lower in both markets, but it was a wild week. Futures plunged early in the week and New York fell to long term support areas. These areas held and a sharp short-covering rally brought prices almost all the way back to close with relatively minor losses in New York and a little higher in London. Chart patterns remain weak, but a move higher this week could negate the downtrends. The main crop harvest should be about over and mid-crop harvest is still a month or more away. The main crop harvest is active in West Africa, and Ivory Coast arrivals are strong. However, arrivals have started to fade. The weekly pace just a month or two ago was about 15 percent ahead of a year ago and now is under 10% of a year ago. Growing conditions are generally good in West Africa. Some early week showers and cooler temperatures were beneficial, it is warmer now and mostly dry. Harmattan winds were reported early in the week in Nigeria, and there is talk of production losses there. Cameroon is also reporting less production and prices there are reported strong. Conditions appear good in East Africa and Asia.